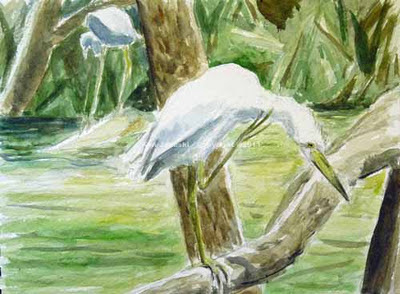 Often the blahs of winter seem to nudge me towards colorful neo-tropical migrants in my art. I remember beginning 2011 with a quick watercolor of an Indigo Bunting. 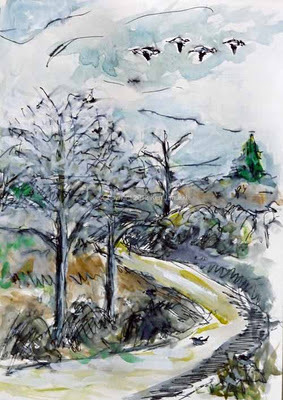 The grays, white and mud browns of winter seem to call out for brighter, warmer colors. 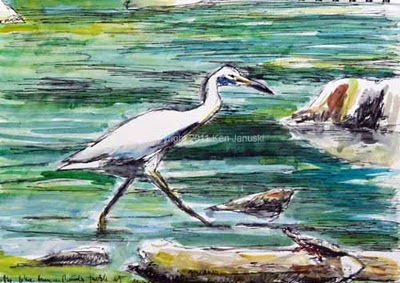 But as this January ends I think it has to be called 'The Month of Herons.' 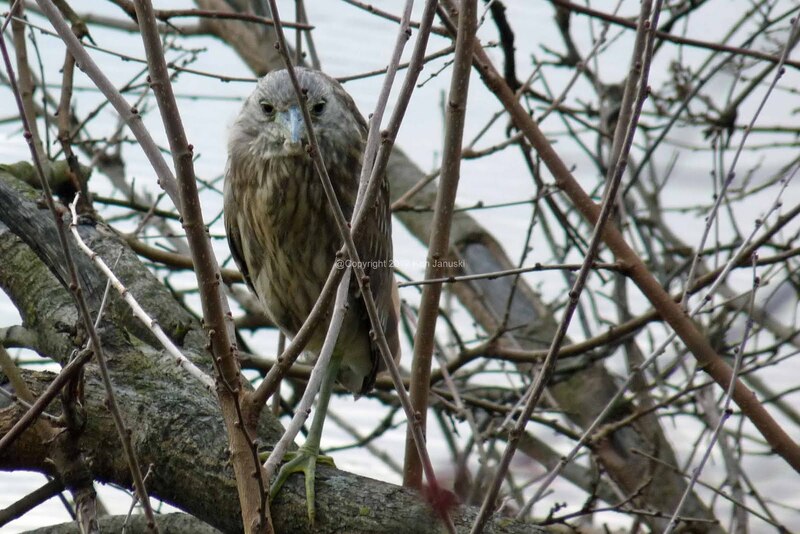 Between the new painting of the two immature Little Blue Herons at Morris Arboretum, the juvenile Black-crowned Night Heron seen at the Manayunk Canal last week and then the comparison of it with the juvenile Yellow-crowned Night Heron seen at the same place in the summer of 2010 it has been a month of herons. There have also been a number of sparrows, particularly the dead Song Sparrow killed by a backyard cat. But mainly it has been herons. So as the month ends it makes sense to show the latest version of the immature Little Blue Herons. It has definitely gotten more realistic. I don't think I've ever painted tree bark before, or even had the desire to. And even though this painting started out in an abstract vein something has pulled me toward realism. So for me it is a surprising painting. But part of the enjoyment of art is being surprised. I think this is about done. If so I'll include it in a show that opens next Saturday and which I'll mention in next post. Once I went to the larger canvas that I'm using on most recent acrylic I needed to reconfigure my studio. The only place to paint such a large canvas was on a full size easel facing my windows. That meant that all the light was behind the painting and very little in front of it. I was sort of painting in the dark. Finally yesterday I pulled out some old floodlights that I used to use when photographing artwork for slides. What I saw was a completely new painting. What was previously subtle now looked brash and unfinished. So today I reconfigured the studio once again so that I could both get better natural light and use the floods if I wanted. I'd already been tending toward realism as the painting developed. Whether it was the better light or something else I've continued in that direction. I've changed the color of the water to closer to what it really was: swampy green rather than deep ultramarine blue. 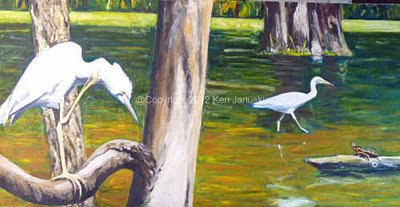 I also changed the light on the foreground tree on which the closest herons sits. Those were the more obvious changes but there were others. Now that I can see better I know that I'll need to do more. I hope that eventually it will resolve into a unified painting that I'm pleased with. As I continue with acrylic I don't think I'll continue with these blow by blow accounts. But since I started that process with this one it seemed wise to continue. If I finish this by the end of the week it will go into a show on Saturday. It's a bit harder to get a good photo on this easel so please excuse the off-center quality of the photo. I'm not an expert birder. 'Expert' of course is a relative term. But I've had the experience of knowing some expert birders, either personally or in print or online, so I have some idea what a real expert is. With that in mind it seems foolish to write this post comparing juvenile Black-crowned and Yellow-crowned Night Herons. 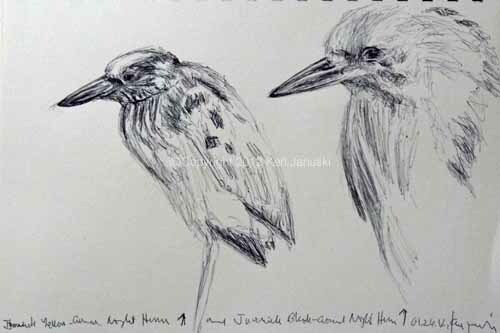 It's doubly foolish because the drawing at top is based on two photos I've taken of juvenile night herons over the last 2 years. I'm convinced that the photos show a juvenile Yellow-crowned Night Heron from over 18 months ago and a juvenile Black-crowned Night Heron from just the other day. But I could be wrong. Both were seen at the same spot along the Manayunk Canal in Philadelphia. 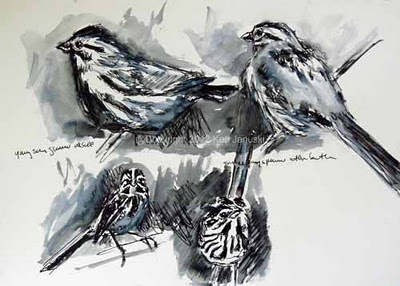 What I'm trying to do in the sketch above is to do a bit of a field guide ID workshop on differentiating the two birds. This is what's foolish. I'm not an expert and I could be wrong. But in this case I think I'm right and I thought the sketches might be helpful. The first thing that struck me is the bill of the two birds. Though they can both look blunt in certain views in profile the Black-crowned, which is the bird at the right, is more pointed. I think this is due primarily to the fact that the tip of the lower bill in the Yellow-crowned starts off at one angle then turns to another. This gives a blunt impression rather than a sharp one. This is one of the things obvious in the photos of the two birds and I tried to show it here. These differences are consistent with Sibley's guide. Another difference mentioned in guides is the extensive yellow on the bill of the Black-crowned. Unfortunately my photos don't really show the lower bill colors clearly. The upper bill is almost completely blue. The lower bill does seem lighter though, perhaps a muddy yellow-green, whereas the photos of what I decided last year was a juvenile Yellow-crowned show a wholly dark blue or blue/gray bill, with the lower bill being darker than the upper. I didn't try to accentuate this in the drawing above. One thing that I think is critical in bird identification is to first determine what you see, then try to match it to an ID. So for me I have no use for digital guides taken afield. I think people are better off looking at the bird and really studying it. Sketching helps in the looking. In any case that's what I'm trying to to here: look at the most noticeable differences in the birds and then see how they compare to what the guides say. With the bills both the photos and my sketches match the guides in determining the bird on left to be a Yellow-crowned and the rightmost bird a Black-crowned. One other obvious difference in drawing the birds while looking at the photos is that the streaking on throat and chest is much finer and more distinct on the leftmost bird. I'm not sure I've gotten that across as well as I could have in the drawings. The rightmost bird has more muted, blended streaking. This was very evident in the field. This also in consistent with the IDs of Yellow-crowned on left and Black-crowned on right. It was using all these clues both last summer with the Yellow-crowned and this week with the Black-crowned that convinced me of their identifications. And the guides agree. Another striking difference but one that I didn't accentuate here because I wanted to focus on the head area is the extensive white markings on the wing converts. They are much larger and more striking on the Black-crowned. I tried to show this in yesterday's watercolor but wasn't as successful as I could have been. Other clues that confirm the ID: the legs are longer on the Yellow-crowned. I didn't show this in the drawing but it is clear in the photos. Finally something I wished I'd noticed as I finally flushed this week's heron: the feet of the Yellow-crowned are much more visible behind the tail than those of the Black-crowned. In conclusion I'm going out on a limb here by trying to explain how I differentiated one juvenile night heron from the other and saying why I believe my IDs are correct. And I have to add I feel a little safer doing this in that no one from the PA Rare Bird List has disagreed with either ID. But I'm not at all an expert. I did the above sketch partially for my own education. 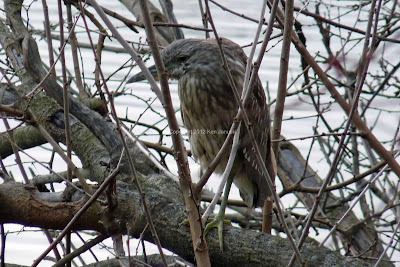 But I thought others who have trouble with IDing juvenile night herons might also enjoy it. Oh yes, for anyone interested in the medium: this is in ballpoint pen. I always like to take the opportunity of portraying any unusual bird sighting in paint. 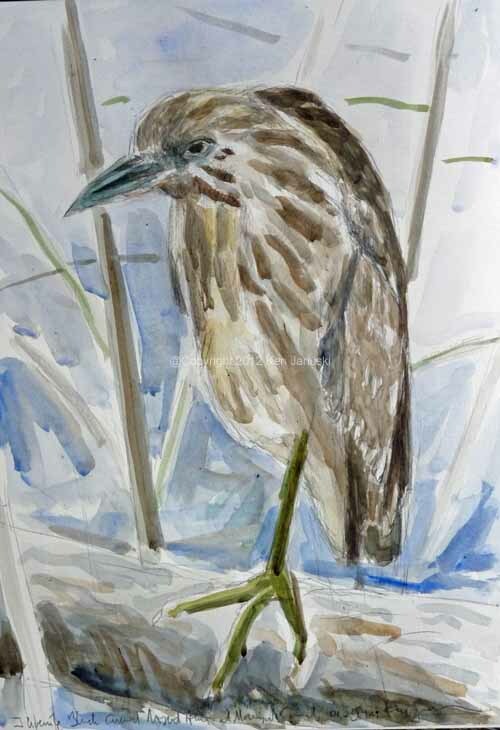 So after seeing the immature Black-crowned Night Heron at the Manayunk Canal yesterday I wanted to hold off on posting photos until I'd also been able to do a watercolor. But the number of hits on my site last evening convinced me to just go ahead and post the photos in the previous post. Everyone who has responded to it has agreed it's a juvenile Black-crowned Night Heron, a really surprising bird for this time of year. I rarely go birding without my sketchbook anymore. It was only by happenstance that I had my camera yesterday. In any case after a couple of quick photos I wanted to do some sketching. 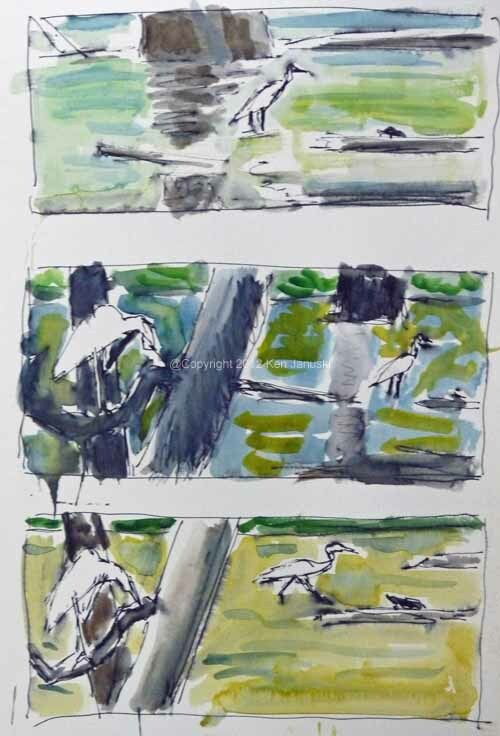 Unfortunately the heron faced me straight on and there was a great deal of foreshortening problems in my rendering of his bill in the field sketch above. At least I captured the pose though I think. We also saw a bird that I flushed. When s/he finally landed across the Schuylkill River it was just a speck. But I wanted to sketch it anyway, especially the blond blush at back of head. When I got home I finally concluded it was a female Hooded Merganser, not a surprise there at this time of year. It is at the bottom right of the heron field sketch. At top is a quick watercolor based primarily on the photos I took. I'm a little disappointed in the wings, particularly the wing coverts and their white markings typical of a juvenile Black-crowned Night Heron. But it is successful in some ways and I hope will later be the impetus for a more developed painting. For anyone looking for documentary photos rather than sketch and watercolor they are in the post below. I knew that I shouldn't expect a night heron in January. But there's this perverse notion that always takes hold of me that because I once saw a bird in a certain location another of the species should be there every other time I visit. At least there should be a possibility. Never mind that it's the wrong season, that the one time I saw it might have been a fluke etc., etc. But I was recently reading 'The Black Swan: The Impact of the Highly Improbable' by Nassim Nicolas Taleb, and he mentioned a study about how people's guesses regarding numbers or probabilities were influenced by the most recent number they'd seen. This is completely irrational and yet it happens. The mind works in very mysterious ways. 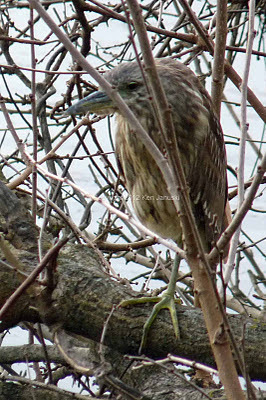 Nonetheless I didn't expect to see an immature night heron along the Manayunk Canal today. Three Great Blue Herons was more than I expected. A Hairy Woodpecker was a nice surprise. And yet there it was. I'd been greatly surprised to find a juvenile Yellow-crowned Night Heron in almost the exact same location in late June/early July of 2010. So I assumed that's what this was. But I can't differentiate juvenile night herons on sight. I did a sketch, took numerous photos, and then when I got home looked at Sibley, Crossley, et al. 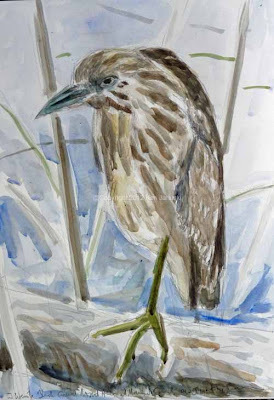 The combination of fairly long pointed beak, more or less of one color and fairly large white spots on coverts lead me to the conclusion that it's a juvenile Black-crowned. As has happened before I'm using this blog for documentation purposes for the Pennsylvania Rare Bird listserv. I'd hope to wait until tomorrow to post these photos, along with the sketch and a new watercolor or two. But I see that the blog has had an unusually high number of visitors tonight and I assume its peoplevlooking for photos that aren't yet there. So I'm putting them up now. Tomorrow I'll work on a watercolor and most likely post it and the sketch. Well maybe. When I started this painting I thought I'd head in a more abstract direction. And I did for awhile. But today I took a step in the opposite direction. I had left different color planes in the water so that there was a largely abstract subdivision of space. I llked this and I think it may be why I thought of Matisse's 'Bathers by a River' when I started. But I also knew it wasn't realistic. It bothered me a bit. Today after adding more details to the head of each heron as well as to the painted turtle I decided to try to unify the water. Maybe the realistic direction of the detail on herons and turtle was contagious. In any csse for the time being we're headed in a more realistic direction. I'm not thrilled with the expense. But I am thrilled by working in this manner again. When I first started this blog I often wrote that I felt my work was no longer very ambitious. I was too busy learning realism and birds to be ambitious. But now I'm more comfortable and I like the excitement of trying to do larger, more ambitious paintings. They can also entail more mental strain though at times. So it's good to know that warmer weather is slowly winding its way here and field sketching will soon be available again. It's the perfect break from ambitious paintings. It was a nice sunny day today and should have been good for painting. 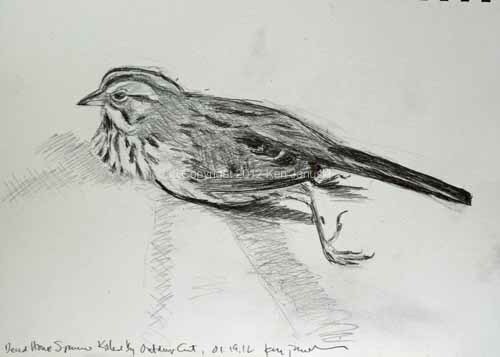 But it seemed wrong to not take advantage of the song sparrow to do some more studies of it. I especially wanted to try to show wing feathers, both coverts and flight feathers. It is always so hard to see them on birds in the field. And, as with this one, their feathers can be truly exquisite. Sparrows surely have some of the most subtly beautiful feathers. So here are two sketches showing a bit more of the wing. The first is in pencil like yesterday's version. The second is in ballpoint pen. 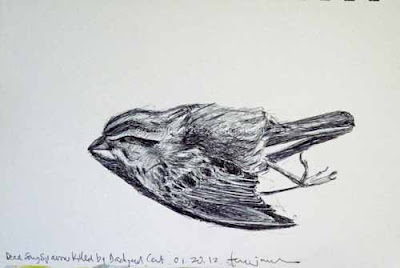 When I first was enthralled by bird art the certain cause was 'Drawing Birds' by John Busby. It opened my eyes to the possibilities of bird art. Though the most exciting part by far was the work done from life I was also taken by one of John Busby's own watercolors of a dead Yellowhammer. 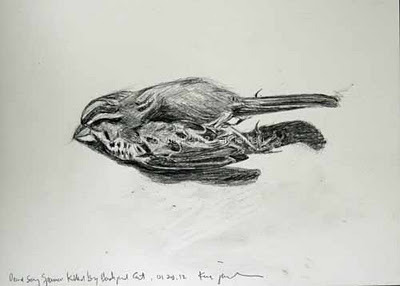 I still think of it when I draw any bird that has met its end. So I guess this is part of a noble tradition, though one I'd prefer to not partake of with any frequency. The pen I used for the ink drawing is a Zebra 301A, 0.7 mm in size. Though I've enjoyed using pens with ink that runs I've also wanted to try a pen with more permanent ink. So far this one has worked well. I've always known that feeding outdoor cats and feeding birds was a dangerous combination. I'd just as soon not feed the cats but my wife feels otherwise. One small cat has constantly had his eye on the backyard birds, especially the Song Sparrows. Even the recent addition of a collar and bell did not help the poor Song Sparrow above. The cat got him today as I was working on the Little Blue Heron acrylic. This is a dilemma that I don't know the answer to. I understand the damage cats do to birds. I also understand that they are meat eaters and that this comes natural to them. My guess is that a bigger yard might help some but that isn't an option. At least I felt that I should take the opportunity to sketch the dead Song Sparrow. I had no intention of posting any photos of the acrylic until it looked significantly different. 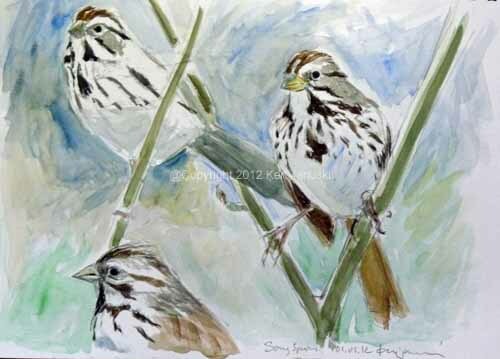 But since I'm posting the Song Sparrow sketch I figured I might as well include the painting too. Well 'large' is relative I guess. The above painting is 2'x4'. Compared to my work of the last few years, which rarely get above 18", it's large. Compared to my much older abstracts in oil and acrylic, generally around 6'x8', it's not large at all. In any case this is the painting after about eight hours work over two days. I think it's evident that there's a battle between realism and abstraction. 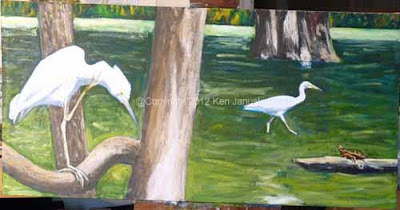 I keep trying to get the pose of the immature Little Blue Heron scratching itself correct while taking great artistic liberties with the rest of the painting. Who knows where it will go? If it's anything like my old abstractions it may look nothing like this by the time I'm done. On the other hand my recent forays in naturalism may rein my experimental impulses in a bit. One thing I should note is that Henri Matisse's 'Bathers by a River' keeps floating around in the back of my mind. I haven't seen it in years but I know a vague recollection of it is somehow entangled in this painting. One last thing. Because this painting is large it's hard to get a good photo of it. This photo is very much out of focus, and also photographed in horrible light. As the painting moves along I'll see if I can get some better photos. I was an abstract painter for many, many years. But I've only done one primarily abstract work in the last six or seven years. A few days ago I was sorting through some old frames and canvases from my abstract days. I was hoping that I could salvage a few unused frames to use on my recent bird paintings and drawings. I found one or two. What I didn't expect to find were some primed but unpainted canvases all set to be painted on. Nor did I expect to be taken with some of the old abstract paintings I found. I put a lot of work into my abstract work. I consider them very accomplished (even if the rest of the world doesn't). Most of those paintings I remember well. But I'd forgotten about some of these smaller works that had been banished to the basement. One of them is at the top of this post. It's an acrylic, about 32x32 inches. Since I can't remember what I originally called it, or if I even named it, I'm temporarily calling it 'Sit Still.' This for the slightly rocking, off-balance quality that it has. It might not be evident in the photo but there is much visible underpainting in this. It comes from changing, changing and changing until I felt that everything, shape, color, balance all fit together. In many of these works there's a balance that, at least to me, always seems about to fall apart. One of the unpainted canvases I found was an odd 2'x4' shape. I don't like such strong horizontal, or vertical if you turn it on its side, formats. I can't imagine why I made one in such a size. But beggars can't be choosers, don't look a gift horse in the mouth, etc., etc. My recent return to acrylic painting has been limited to canvases not much larger than 18 inches in the largest dimension. I've been happy with them but they seem like studies. I used to paint 6'x8' paintings. So this fairly large found canvas seemed like a good opportunity. Because it's such a strong format many things wouldn't work on it. Sometimes sketchbooks are sold in this shape and called 'landscape' format. It does lend itself to some panoramic landscape scenes. I haven't done much work like that, especially work that includes birds. But I did remember one recent ink and watercolor sketch that might work. It is the painting of an immature Little Blue Heron with a Painted Turtle on a log above. It's really not that horizontal but I might be able to improvise on it. That thought led me to this earlier watercolor of immature Little Blues, itself a composite of numerous sketches and photos. This morning I did some preliminary sketches combining these two works in various ways, using a very strong horizontal format. They're at top, beneath the abstract painting. I suppose this might seem very odd compared to the realism of my recent sparrow works. I probably wouldn't have done it if I hadn't run across the abstract acrylic, realized how much I liked it, and then found the blank canvases. I sometimes wonder if art should not be split so much into abstract and realistic as urban and rural, or perhaps modern and traditional. For most of my life I've preferred the modern and the urban to the traditional and the rural. But never exclusively. Even in the height of my infatuation with Matisse and Picasso I admired people like Chardin and his quiet still lifes. Since I've been working naturalistically I've stayed closer to the traditional, rural, respectful of nature and not willing to take liberties with it. I still don't like the idea of possibly cheapening it by using it as just a frame for abstraction. But I think it may be possible to avoid that. In any case I think I'll be trying it soon on that odd, horizontal canvas Many of my lincouts tend more toward abstraction but never so far as the painting at the top. I'm guessing that this new painting will go even further toward abstraction, but I might be surprised. 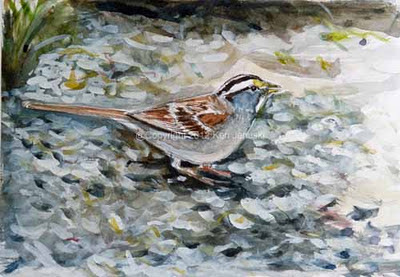 I've seen a lot of White-throated Sparrows recently. They're a common winter visitor, though rarely in our own backyard. The ones with a white supercilium are particularly striking. As I looked through the photos I've taken of them I was struck by the one I used for the 6x8 inch watercolor and gouache above. Why? The sense of sculpture. The way the line of the upperside of the tail worked with the downsweep of the primary feathers and the forward stance of feet to create an amazing sense of balance. To me this seemed particularly sculptural. That it turn got me thinking about how many aesthetic qualities there are in birds, qualities that I think make them particularly appealing to artists, even if they've never been naturalistic artists. Between the shapes, the balance of complex poses, the textures, the color and their movement there is just a wealth of qualities that almost any artist might find intriguing. Add to that the appeal of someone who is actually a birder, or maybe someone who is just a conservationist and I think you can see why so many artists have an interest in birds. Many are not bird artists. But I wouldn't be surprised if many of them, in the back of their minds, aren't half-tempted. I've been fairly busy over the last 6 weeks either counting or scouting birds for official counts. In early December there was the Christmas Bird Count. Yesterday was the Philadelphia Mid-winter Bird Census. We generally do our part at the Schuylkill Center for Environmental Education. But this year I was asked to add the section of the Wissahickon where the Red-headed Woodpecker has been for three months. That meant scouting the Wissahickon to make sure he was still around and scouting SCEE to see what birds seemed to be around there. Of course there's never any guarantee that the birds you see when scouting will also be there when the official count takes place. All of which means I've slacking off on my art work. I do try to do sketches while I'm out but it's always a bit harder in cold weather. For instance I just didn't feel like trying to sketch the Red-headed Woodpecker when we found him yesterday. A few bad photos were sufficient. And of course there's just the pleasure of seeing this beautiful bird. That always takes first place. I would have expected that the woodpecker would be the rarest bird I'd see yesterday. And it was. They're just never in Philadelphia, especially in winter. But it wasn't the most surprising bird. 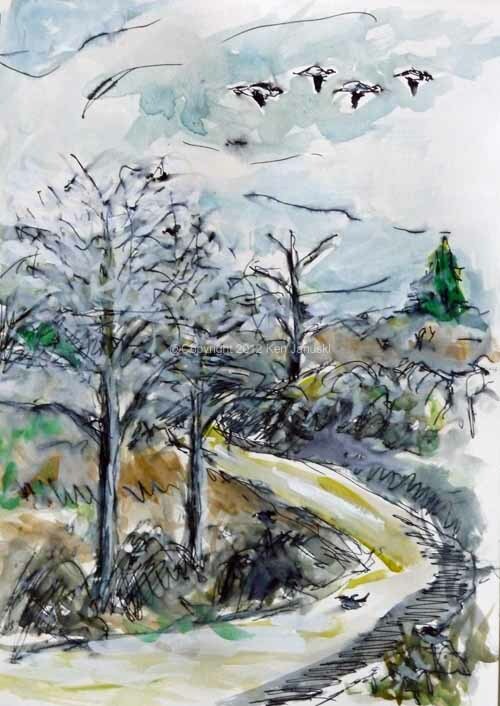 That occurred as I tried to ID tiny birds in the top branches of the two trees in the forefront of the ink, watercolor and gouache sketch at top. As I did so one of the people also on the count with us said 'What are those birds?' When I looked high in the sky I found: Snow Geese! I've never before seen them in Philadelphia. That doesn't mean all that much since I don't spend much time in areas where they might be possible. Still it was a great shock to see four of them flying by. I later learned that someone doing another section of the count not far away had also seen some, this time a flock in the hundreds. Since they are in other areas of the state right now it's not a total shock. But it's one thing to know that they're being seen in the vicinity and quite another to see them yourself for the first time. They were here and gone in seconds so I never even thought of any artwork based on them. On the other hand I did look at them hard, even for the very short time that they were visible. Today a day later I still have a mental image of them. That's what I used in the sketch above. All the rest is made up, though I did try to indicate the many twiggy branches at the top of the trees where I was trying to identify some very small birds. This is done in a now familar manner: ink from a Bic ballpoint pen that runs when water touches it, watercolor and white gouache to try to bring some light back into the dark areas that the runny ink creates. The ink run so quickly that it's almost like trying to paint with quicksilver. Once water touches ink who knows where it will run? For some reason I like working like this. It seems to lead to quick paintings, rough though they may be. When I was studying art in college 'illustration' was a dirty word in the art department as well as in just about every art publication I looked at. I was somewhat sympathetic to this view. I think one reason for this is that it's not hard to find art that sells based on its cuteness. The art is valued almost entirely for the 'cute' subject and not at all for either the honesty of the artist in portraying it or for his or her artistic skill. It can seem horribly sentimental. At the same time though, even way back then, there was something that bothered me about this. Regardless of what anyone says about progress in art in the visual arts there will always be a place for representational art, for art that honestly portrays the world around it. I deliberately used 'illustration' in the title of this post. This is an illustration, even if only in a very rough manner. I'm portraying an event that occurred and that I found memorable. That impetus will always be a valuable part of art I think. 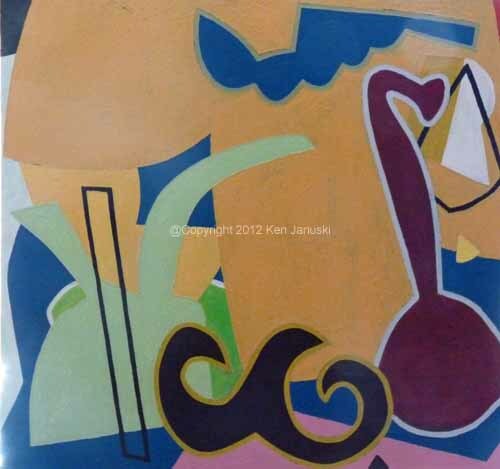 I continue to love very many types of abstract art and I think my own work is fairly abstract. But that doesn't need to be in opposition to illustration. They can readily work together. I also wanted to continue my studies of Song Sparrows. So today I did a few more, based on photos like those in the last post. 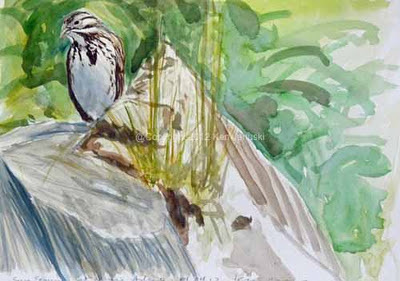 The top sketches show a young Song Sparrow that had just bathed. The bottom two are mature birds including one from our backyard. This is the same runny ink style. It's hard to explain. I guess you'll either like it or you won't! I do find it very useful in inspiring me toward more developed work. This as usual is done on one of the heavier Stillman & Birn sketchbooks, this time one from the Delta series. It seems like every winter I spend a lot of time going through photos I've taken, looking for a subject for the next painting or print, but also seeing something new about a bird that I hadn't noticed before. I don't advocate using photos in art. I think you learn so much more and get so much more engrossed when you're working from life or from sketches from life. But photos do have their use. At this time of year I often find myself trying to do detailed sketches from photos. 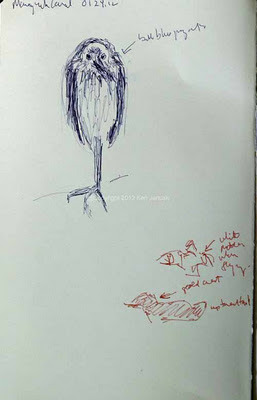 The purpose of the sketch isn't great art; it's to learn how the bird is put together, to just look at it more closely. Recently I've noticed the difference in sparrow bills, more from photos than life since I don't really see a great variety of sparrows on a normal day. And Song Sparrows always surprise me with the large size of their bills. So I decided to do a number of sketches trying to concentrate on that. Today's sketch is at top. After I'd done the pencil sketches I decided to try adding watercolor. Yesterday's study is above. I originally intended to put another sketch on the right. But once I added watercolor to the sparrow on the left I found myself thinking that the only way to make it look halfway decent as a picture, even though a picture wasn't my original intent, was to continue the scene all the way across the page. These might have looked better left as pencil sketches. But I also want to improve my realistic portrayal of birds in watercolor so it seemed worth trying to add watercolor to them.